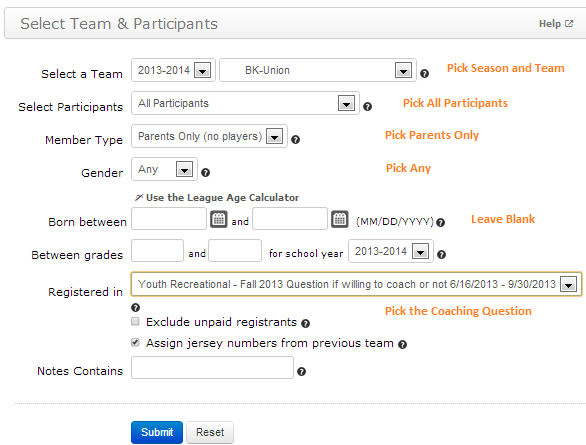 To assign coaches to teams you use the Assign Roster link. It is important to make sure you set the filters correctly or you will see parents that are not in your league and could end up assigning them to teams that they are not coaching. Select a Team - pick 2015-2016 in the first drop down and then pick a team from your league in the 2nd drop down on that row. You can’t pick league names you must pick a team. This is the team you will be assigning coaches too. Gender (Male or Female) and Grade (PreK, K, 1st, 2nd, 3rd, 4th, 5th, 6th, 7th, 8th, 9th, 10th, 11th, 12th) must be entered exactly as shown. Gender2 and Grade2 for coaches who are coaching more than one team. 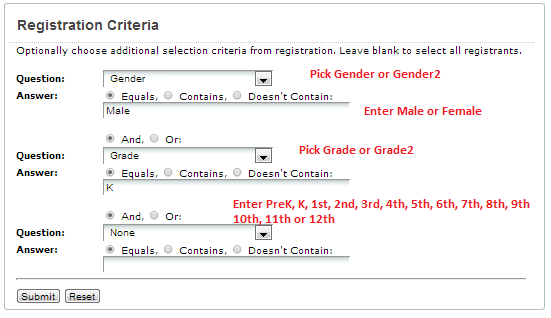 Note: you can use just Gender or Grade if you want to list everyone who is coaching. Click Submit again and the next screen will list the team you selected on the left side and the coaches on the right side. Everyone assigned to the team will be displayed. Make sure under Poston that you pick the Coach or Asst Coach option for coaches and then click Submit to save the roster. If you do not do this the coaches will show up on the roster as players.